Now that we all know that Linden Lab is working on a brand new next generation virtual world that eventually will replace Second Life, some people feel that it is time to pack their bags, put on a lifebelt and jump overboard. After all, why should we continue to build for and invest time and money into a world that we know will eventually cease to exist? It is way too early for that. Put your suitcase down, take off your coat. Ebbe Altberg (CEO of Linden Lab) and the official announcement both make it clear that Second Life is going to live on for quite some time and will not be neglected. Of course, now that quite a large part of Linden Lab is going to concentrate on building this new world, they will spend less time doing work for Second Life. Nevertheless, the Beta testing for this new venture is still at least a year away according to Ebbe and till that time comes, it will be (almost) business as usual in Second Life. And I say business because until this new world is up and running and making Linden Lab a pile of money, Second Life will remain to be a very important source of income to them. I think that as long as there are people using Second Life, paying their tier and as long as LL doesn’t suddenly have to invest a lot to keep it running, they will not turn the lights off for a long time. 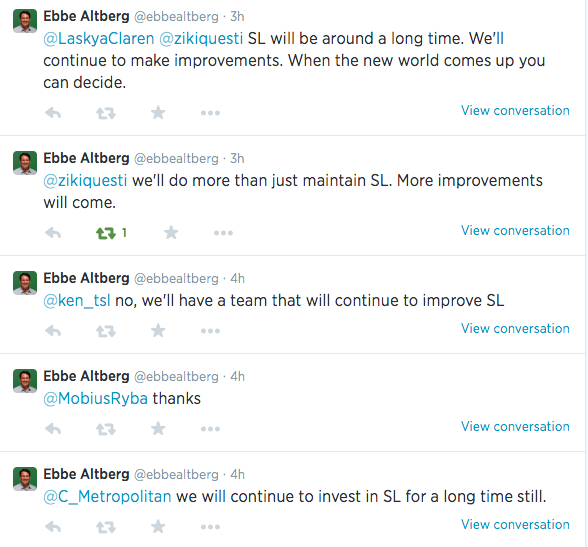 Ebbe promised that not only will there be a team still running Second Life, but that they will also keep improving it. Of course, things will change. A huge team of LL employees will not be spending time and money on changing SL dramatically, but it won’t be abandoned either… yet. Second Life and the New World (we really need a name), will coexist for a while. We will be able to choose and if we desire it, stay in Second Life. Eventually, one day, yes Linden Lab will probably take a good look at Second Life and realise that most of it has been abandoned, people have moved to the new world and that it really cost effective anymore. Then they will switch it off. But this could be years away. I guess we are, sort of, in the same boat as Linden Lab. If you have a shop or club in Second Life, would you close it even if it is still being used and making you money? And although I might reconsider starting huge new building projects or another sim until they can confirm that we can at least transport our mesh builds to the new world, most people in SL are here for experiences, and these will continue. As I told a friend yesterday, if you want to keep drinking my virtual schnapps you better keep paying for it. Till the big move comes, business as usual…?